Lake Powell on the border of Utah and Arizona was created when the controversial Glen Canyon Dam was built and flooded Glen Canyon in 1963. Over the next 17 years, water backed up for 186 miles, forming the 250 square mile reservoir, inundating Glen Canyon and hundreds of miles of side canyons, and affecting natural flows and sediment deposits downstream in the Grand Canyon. 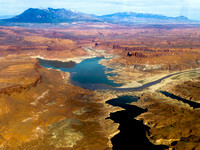 Current demand and drought conditions however, are causing parts of Glen Canyon to return. Places like the confluence of Coyote Creek and Escalante River that was once submerged underwater is now supporting cottonwoods and gamble oak, a stretch of Imperial rapids and a Native American sarcophagus that once held a mummy have also resurfaced with dropping water levels. 2018 is projected to be another dry year, with forecasts saying Powell will only get 47% of its average inflow. 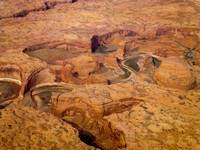 If the water continues to recede, more lost canyons could become exposed like Dungeon, Labyrinth, Anasazi, Iceberg, Moki, Last Chance, Mystery Rock, Hidden Passage, Twilight, Cathedral Canyon and Lost Eden. Conservation groups are working on an ambitious proposal called the Fill Lake Mead First Project to drain Lake Powell to a lower level and store the water in Lake Mead instead. Both reservoirs are currently operating far below capacity. Proponents argue that the plan would save 500,000 acre feet of water per year lost to evaporation, restore parts of Glen Canyon, and generate more power at Hoover Dam.